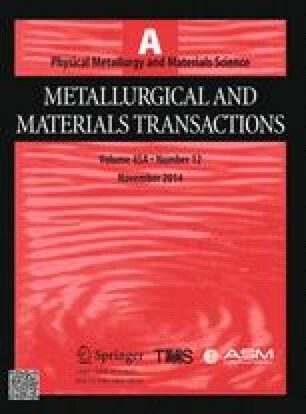 Effects of Mn addition (17, 19, and 22 wt pct) on tensile and Charpy impact properties in three austenitic Fe-Mn-C-Al-based steels were investigated at room and cryogenic temperatures in relation with deformation mechanisms. Tensile strength and elongation were not varied much with Mn content at room temperature, but abruptly decreased with decreasing Mn content at 77 K (−196 °C). Charpy impact energies at 273 K (0 °C) were higher than 200 J in the three steels, but rapidly dropped to 44 J at 77 K (−196 °C) in the 17Mn steel, while they were higher than 120 J in the 19Mn and 22Mn steels. Although the cryogenic-temperature stacking fault energies (SFEs) were lower by 30 to 50 pct than the room-temperature SFEs, the SFE of the 22Mn steel was situated in the TWinning-induced plasticity regime. In the 17Mn and 19Mn steels, however, α′-martensites were formed by the TRansformation-induced plasticity mechanism because of the low SFEs. EBSD analyses along with interrupted tensile tests at cryogenic temperature showed that the austenite was sufficiently deformed in the 19Mn steel even after the formation of α′-martensite, thereby leading to the high impact energy over 120 J.
Manuscript submitted March 26, 2014. This work was supported by the Ministry of Knowledge Economy under a Grant No. 10044574-2013-45.